Maybe a year and a half ago, a buddy of mine tipped me off to a game called Kingdom Rush on iOS (and possibly other devices?). What I found was one of the coolest and deepest tower defense games I’ve ever come across. The art style was smooth and unique, while the gameplay was addictive and the amount of choice and strategy was staggering. So now, the spiritual sequel arrives. 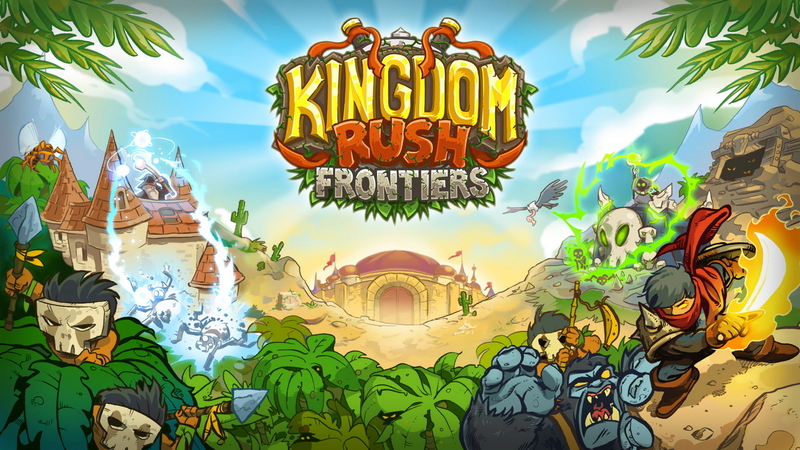 It’s not called Kingdom Rush 2, because it’s mostly just expansions and additions, not a completely new experience. The towers have been revamped so it’s a new strategy and there’s new enemies and everything, but the core concept is the same. Tower defense games, if you’re unfamiliar, is a type of game where you have to stop a stream of enemies from reaching a certain point. Popular examples include Bloons where you pop colored balloons and even (to a point) Zombies vs. Plants (review here). You place these “towers” in strategic locations and then upgrade them to do more damage as the foes get tougher. 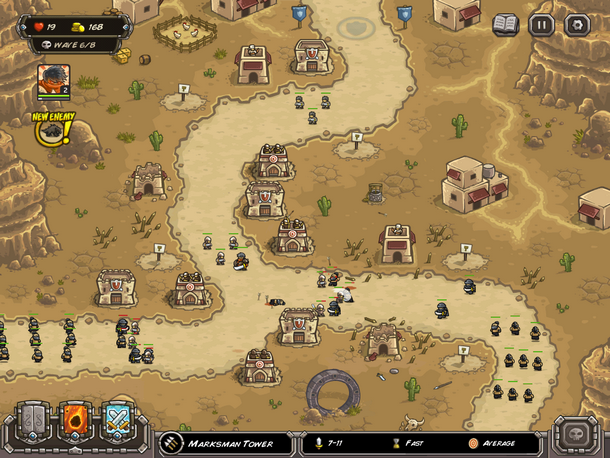 Kingdom Rush Frontiers gives you four basic types of towers: Archer, soldier, magic, and artillery. 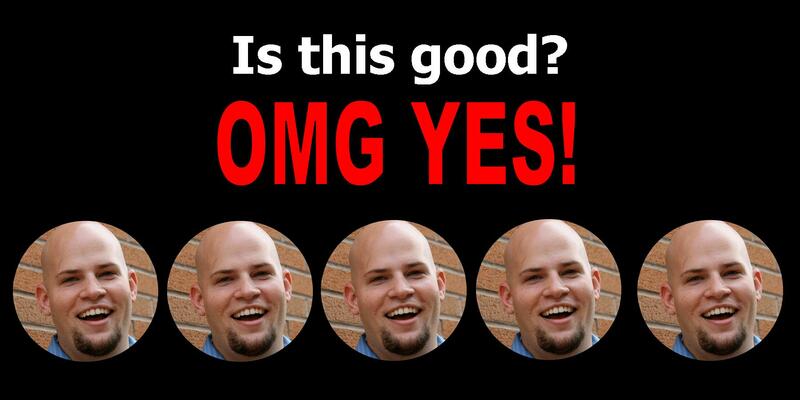 Each one can be boosted and then you can choose one of two specialties. For example, you can upgrade the artillery tower to either become a walking mechanical warrior which shoots missiles or it can become a large drill that pounds the ground and does damage to anything walking by. On certain maps and against certain enemies, these are both useful, so a lot of the game depends on which tower would be most beneficial and in what location. The progression of the campaign is really interesting. You start (as seen above) fighting in this desert-like area against assassins and genies and sand-burrowing worms. But then, in just a few levels, you’re now facing off against pirates, followed by tribal natives, then aliens, and then underground lizard warriors. Each new type of villain brings a unique spin and it definitely keeps you guessing. For example, the tribal natives are cannibals, so if you place soldiers, the cannibals can actually fill up their health. When I lost that round, I was so confused til I realized that I was allowing them to fill up constantly. So instead, you scrap the soldiers and focus on other towers. The enemies have unique strengths and weaknesses which should definitely be considered. The levels are also interactive to a new degree. In one of the desert levels, we see two tuskan raiders from Star Wars on a mountainside and they help you out by shooting enemies every once in a while. But other times, the level is against you, such as a dragon that flies across the landscape and torches your buildings or a giant sand worm that eats your units. Also, as I learned the hard way, sometimes the actual layout of the level changes mid-game. I had built up a fortress on one level but then I saw a barbarian cleaving his way through the forest, building a new path. I had neglected the back portion of the map because I was overconfident and quickly lost that level. So, the enemies are unique and engaging. The levels are both visually gorgeous and challenging to you as a player. The new tower types are fun, my favorite being the ground-smashing artillery upgrade, which can be boosted to light the ground on fire. In a strategic chokepoint, this tower will decimate most enemies. You can combine this with a magic tower upgraded into a necromancer, who raises the dead as skeletons. So anyone that gets smashed to bits comes right back to life and fights for you. Every tower upgrade had a purpose, I didn’t feel like any were useless during the course of the campaign. And then in addition to the towers, you get a hero for each level. The game comes with three, but you can purchase (with real money) another handful. The three you start with should be enough to satisfy you though. Mirage is your usual ranged rogue, with Alric picking up some more up-close and personal attacks. Cronan was the most interesting, as he was paired up with wild boars, a hawk, and a rhino stampede. So I used Cronan for my whole runthrough almost, as I felt confident this whole mini-army could stop any leaks in my defense. The in-app purchases for heroes is a little unsettling but they’re by no means necessary. When the game is only a few dollars, I wouldn’t pay $7 for a hero (though yes, this hero is a dragon and it’s pretty awesome). Not much doesn’t work. The game is polished, just difficult enough to challenge you (I only played on casual, so there’s two tiers of difficulty beyond that for people seeking more challenge), and the visuals are engaging. No brainer. It does cost a few dollars but I easily got my money’s worth, working on the campaign for a week or so and then there are extra difficulty levels, bonus challenges, and other things to work at, once you finish. The game is refreshing in its amount of choice and strategy and should even please gamers not traditionally fond of tower defense games. Hands down, worth the buy. I believe the original Kingdom Rush went on-sale (or free), so maybe check that out if you have reservations about paying for the sequel. This entry was posted in iPhone and tagged adam ryen daniels, alric, cronan, frontiers, i am your target demographic, ios, iphone game, ironhide, kingdom rush, mirage, mobile game, review, tower defense, towers. Bookmark the permalink.